Waterbom Bali and South Bali Day Tour is suitable program for friends and family trip. This tour combines fun activity in Bali Waterbom, relaxing massage in Anika Spa, and delightful dinner with sunset view at beach. Get splashed first at Waterbom Bali. 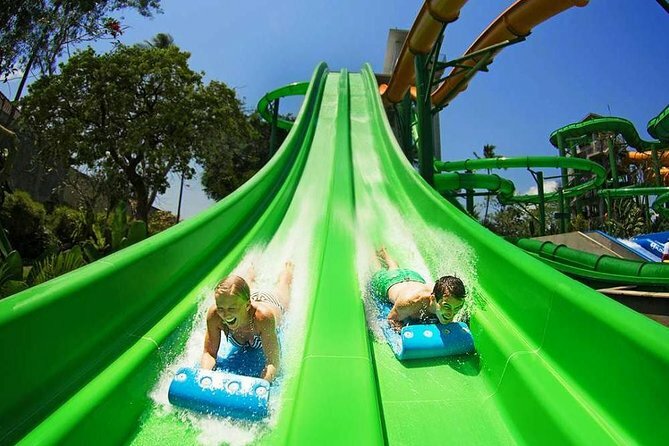 There is so much fun to do here like thrilling in various types of water slides or just relaxing at the gazebos while enjoying the garden view around the waterbom. After all this vibrancy, it's time to get your body relaxed with 2 hour massage. The driver will take you to massage shop in southern Bali. This tour is not completed without dinner. Before the tour ends, have a delightful seafood dinner while indulging in the golden sunset view along Jimbaran beach. - Please wait the driver at lobby hotel. - Show the voucher to your driver when he picks you up at the hotel lobby. - If your car is late, please contact us by phone number listed on your voucher. - Please send us inquiry for Child price. - If you use AirBnB accommodation, please write down the nearest hotel address from your Host location. In order to simplify the pick-up service, we will pick you up at the nearest hotel lobby from your Host location.